If you are not yet a member of the Ramblers, we would encourage you to think about joining. You will be supporting the organisation's valuable work for all walkers. Try walking with the Group FREE for up to 3 times if you wish. You will find us a very friendly lot. Membership costs £3.35 a month or £35.85 annually for an individual and £4.40 a month or £47.85 annually for joint or family membership. Concessionary Rates of £2.35 a month or £23.00 annually (Individual Concessionary) and £3.10 a month or £30.75 annually (Joint Concessionary) are available for full time students, and those on means tested benefits or solely reliant on the state pension. FREE junior membership cards for members’ children (under 16) are available on request. These rates are valid until 30/09/2019. Membership lasts for 12 months from the date of joining. 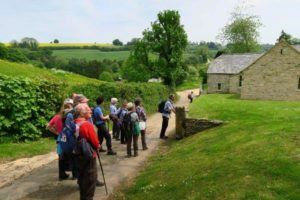 Not obligatory, but as a bonus, you might choose to try walking with the Group, having great fun and friendship, and helping each other to get the know the beautiful Cotswold countryside around about with walks arranged 2-4 times a week. We welcome you to try walking with us a few times FREE before deciding whether you wish to join. NEWLY JOINED SOUTH COTSWOLD GROUP? Want some local info? Contact us with your name(s), membership number if you have received it, email and postal address, and Mike aims to be in touch with the latest newsletter within 24-48 hours, if not sooner.